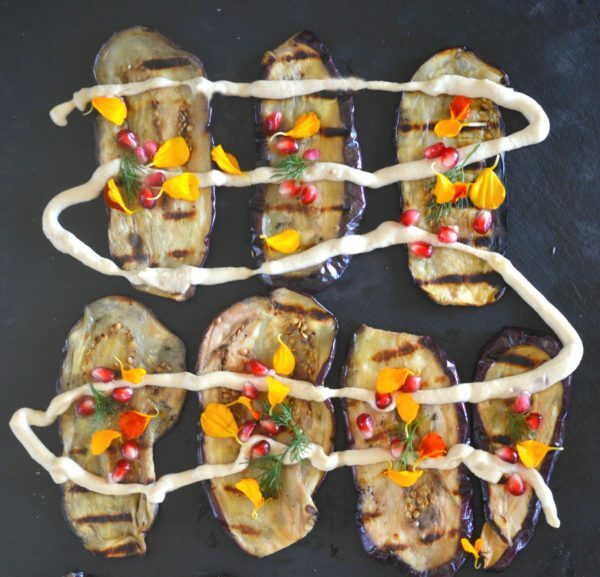 Grilled eggplant with tahini dressing, topped with pomegranate and dill. #Vegan and #vegetarian friendly. You probably think of eggplant dishes as kind of an old fall-back; tasty but not all that nice to look at. But what if you dressed them up with bright, fanciful colors and made it the star of your show? That’s the basic idea of this Eggplant with Tahini and Pomegranates. 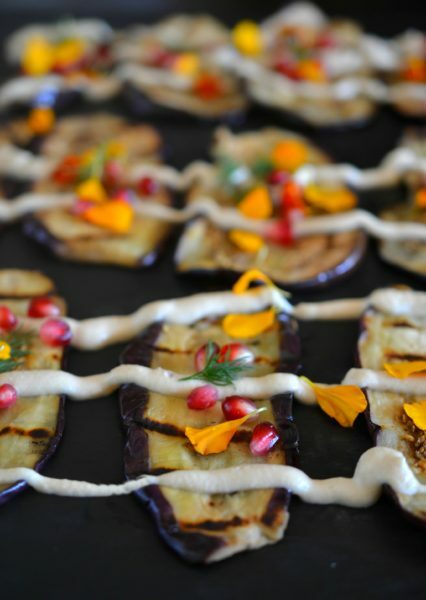 It’s grilled eggplant, topped with a tangy tahini cream, and then garnished with pomegranate seeds and flower petals for a little extra color. We love eggplant because it’s meaty enough to stand up as a main course, and of course it’s vegetarian and vegan-friendly. And we love tahini because it’s got a nutty flavor that adds depth to just about everything it’s drizzled on. This sauce gets its tang from apple cider vinegar, a pantry staple that gives an extra “kick” just when you need it. 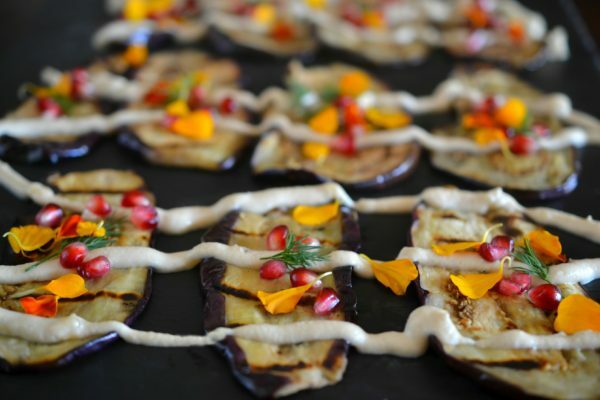 Grilled eggplant topped with tangy tahini sauce and pomegranate arils - perfect for a side dish or a vegan or vegetarian main course. 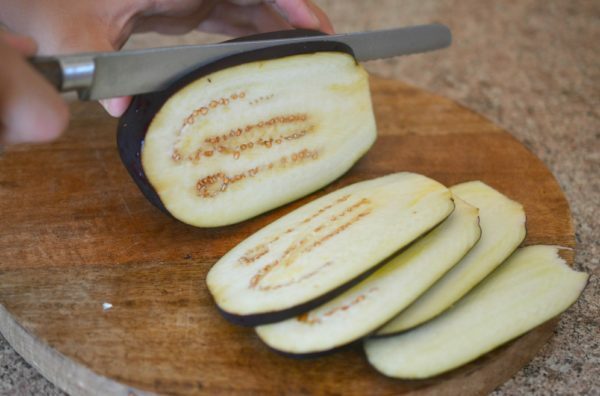 Prepare the eggplant: Remove the cap and slice it lengthwise into ¼ inch slices. Lightly salt each of the slices, place them in a colander, and weigh them down with a heavy pan. Let them sit like this for up to an hour. Then rinse the slices and pat them down. Lightly coat the slices with olive oil and grill them over medium heat, no more than 3 minutes per side, or until nice grill marks appear. 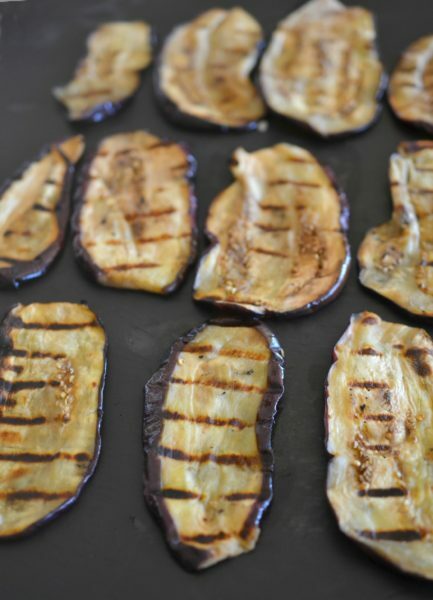 Arrange the grilled eggplant on a serving platter. Meanwhile, whisk together the tahini, apple cider vinegar, garlic, almond milk, and salt. Drizzle over the eggplant, then garnish with dill, pomegranate, and flower petals. Note that when you prep the eggplant, it’s best to salt it and press it down first to drain out any of the bitter taste it might have (particularly if it’s not immediately fresh from the garden). Also, when you grill the eggplant, keep a very close eye on it, especially if your slices are less than perfect (and come on, whose slices are perfect anyway?). Those thinner spots will burn quickly unless you’re paying close attention. Once you’re finished with the (quick) grilling process, you just drizzle, decorate, and you’re done! This makes a pretty side dish or appetizer, but it’s hearty enough to become a main course for a vegan or vegetarian dinner. This is so pretty, too!